The best word to describe the wedding I get to share with y'all today? Sweet. Everything about this wedding was just precious! The couple, the color palette, the details... I can't wait for y'all to see this sweet spring wedding at The Barn! This bride said she and her new husband wanted to keep their wedding very family oriented, so they chose the groom's cousin as their photographer. Her name is Holly Giles, and she did an excellent job capturing this beautiful wedding! Chelsie and Chase were married at The Barn at Twin Oaks Ranch on April 25, 2014. Their color palette was peach, light pink and mint, with gray accents. Their theme was rustic-shabby-chic, and their decor included burlap and lace, peaches, wood accents, watering cans, and gorgeous peach flowers. "I just loved the colors together, and they were perfect for a spring wedding," Chelsie said. "Of course, Pinterest helped me out a lot with finding the perfect color scheme for my husband and me. I also spent endless hours picking out paint swatches at Walmart and Lowes just pairing colors together to find the perfect shades and hues." First off, let's talk about what these lovely people wore! The bride's stunning dress was from David's Bridal. I love this dress! It's both fun and elegant, and it looks perfect on this gorgeous bride. Chelsie had a brilliant idea for her bridesmaids' fun mint dresses. Rather than asking her girls to spend a fortune on a dress they'll likely only wear once, she had them rent their dresses from Rent The Dress. "It was a success and all the girls really liked not having to pay an arm and a leg for their dresses," she said. The bride and her girls also wore boots... and y'all know we're all about that! The groom and his groomsmen looked handsome in classic gray suits with mint ties. I love this look! This is one pretty bridal party, don't y'all agree?! The bride also had two precious, tiny attendants. This little flower girl's sign is precious! As always, this wedding had amazing bouquets and floral arrangements! They were a mixture of peach, light pink, ivory and light green flowers. The bouquets were loose and a little bit undone, with lots of greenery... classic and beautiful! They were wrapped with burlap and tied with lace. "My mom had bought me a gold locket charm with light blue ribbon to tie onto my bouquet," Chelsie said. "My grandma had just passed away the March prior to my wedding, and I was very upset she missed seeing me walk down the aisle. So in honor of her, the locket had a picture of my grandma holding me when I was a baby. It was very special to me, and it allowed her to still be a part of my big day." Some of the sweetest moments from Chelsie and Chase's wedding day took place before their first look. They wrote a letter to each other, which they read before seeing each other for the first time. There are so many sweet photos of this moment, it was hard for me to narrow it down! This couple's ceremony decor was sweet and beautiful! They had a dreamy lace altar, with huge floral arrangements that matched the bouquets. Their aisle was lined with shabby chic watering cans, filled with flowers, as well as shepherd's hooks with jars and candles. I asked Chelsie what her favorite details from her wedding day were, and this is what she said: "Our guestbook was a photo book from Shutterfly that was filled with pictures from our engagement photo shoot. It made it more personable and people not only got to sign in with it but enjoyed looking through our pictures. Other personal details that made it truly my wedding included the locket bouquet charm from my mom, the fact that all the girls wore cowboy boots (Lord knows I cannot walk in heels! ), the pearls I wore were passed down from my cousin’s mother which was an honor she let me wear them, all of the lace accents (because I love everything lacey! ), my customized lacey garter set, and the wine cork boutonnieres the guys wore." Chelsie and Chase's ceremony was intimate, sweet and perfect. Chelsie has one funny memory from the ceremony that she says she'll never forget! "I will always remember that as my brother was walking me down the aisle, the entire time we were laughing about how my garter was slipping down my leg," she said. "Since I was wearing cowboy boots I would have never thought it could get over the boots! But it somehow managed to slip over my toss garter, make its way over my boot, and land in the middle of the aisle! Luckily I had no idea this had happened. I thought it was just in my boot, but my maid of honor, Aubrey, was told to pick it up by Chase’s grandma on her walk down the aisle after the ceremony. No one said anything to me about it, so hopefully no one else saw it. How embarrassing! However, it was definitely a funny memory that I’ll never forget." After the kiss, the newlyweds and their guests headed over to The Barn for a fun, beautiful reception! The decor was rustic-chic-meets-shabby-chic, with burlap and lace details, place settings accented with mint, watering cans with flowers, wood and peaches! "My favorite detail of the wedding would probably be the incorporation of peaches!" Chelsie said. "We hadn’t discussed them in the 3 meetings I went to, but they were a nice surprise. They really tied in the peach color to the color scheme, and complimented well. They looked really cute with the flowers and tree trunks on the tables, as well as with my cake!" Look at this gorgeous ruffle cake from theCakePlace! Swoon!!! For favors, Chelsie and Chase gave out little packages of s'mores! "Our families love bonfires, and it was just the perfect/ideal favor that they got to use at the wedding with the fire pit provided," Chelsie said. The rest of the reception was filled with a sweet first dance, games (even the bride joined in! ), making s'mores around the fire pit, and a sparkler exit! These two went on an impromptu honeymoon! How fun is that?! "Our honeymoon was not pre-planned and it was a spur of the moment type vacation," Chelsie said. "We waited until the morning after our wedding to see how much money we had racked up from the wedding, and decided we wanted to go to Florida. We knew we wanted to stay around the Destin area, so we packed up and hit the road. About 6 hours in we found the perfect place, Miramar Cottages, called and booked our vacation over the phone. I had never not planned a vacation before and the mystery of it all was exciting. We ended up being right outside of Destin, and it was perfect. We had our own little cottage about 3 minutes from the beach. During our weeks stay, we did a lot of shopping (probably too much), ordered delicious drinks, ate at good restaurants, and learned how to become beach bums. It was the perfectly little getaway!" 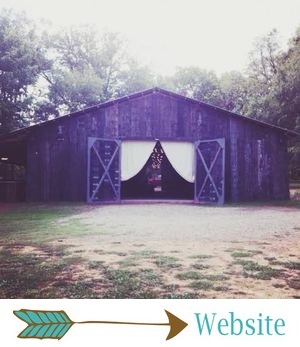 Finally, I asked Chelsie her favorite part about getting married at The Barn, and this is what she said: "My favorite part about getting married at The Barn was simply the obvious; it’s a beautiful barn with gorgeous chandeliers and it was affordable. Even though the venue was a few hours away from us, it was very convenient. I got to live a girl’s dream and basically plan my wedding on Pinterest and they put it together for me hassle free! It was amazing. The fact that they did everything from set up, décor, took care of the catering, already had a cake place, staff for the wedding, etc. made it almost stress-free for my husband and me. The distance wasn’t an issue and it was very reassuring. I honestly wouldn’t have had my wedding anywhere else."